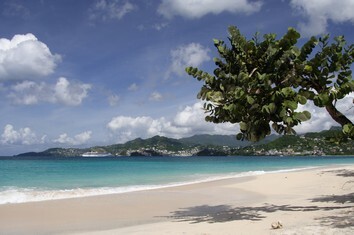 Grenada is a group of three larger islands – Grenada, Carriacou, and Petit Martinique – and several tiny islands in the Caribbean or West Indies. It lies just northeast of Trinidad and Tobago, and southwest of Saint Vincent and the Grenadines. Of these islands, Grenada is by far the largest island and where most of the nation's people live; Carriacou is the second largest island, and home to the town of Hillsborough; and Petit Martinique is the distant third-largest island, which has limited tourist facilities. Christopher Columbus discovered Grenada in 1498. Over the centuries, although control of the island passed from France to Britain (and briefly back to France again), the name endured with just the slightest of alterations, changing from Granada to La Grenade to Grenada. Popular items for purchase include nutmeg and other spices, herbs, real vanilla (beans and extract) as well as rum. It is famous for spices and is known as the "Spice Isle", being a major source of nutmeg, cloves, ginger, cinnamon, and cocoa. Average temperatures range from 24°C to 30°C, tempered by the steady and cooling trade winds. The lowest temperatures occur between January and April. The driest season is between January and May. Even during the rainy season, from June to December, it rarely rains for more than an hour at a time and generally not every day. At the lower or first Concord falls you can paddle around in the basin at the foot of the 35-foot high falls. Headed toward Concord's upper falls, you'll pass through a nutmeg plantation. At the Concord upper falls, also called Fountainbleau Falls, the water streams down into another fresh water pool that's good for swimming. Just south of St George's is the resort area of Grand Anse. A long stretch of golden sand beach lines the bay and is backed by a few hotels and restaurants. Vendors on the beach sell a variety of trinkets and souvenirs. This is the perfect place to bring your family. The bay features rather shallow, warm, and calm water which creates the perfect atmosphere for a day of fun for your kids as well as for yourself. Deep in the heart of Grenada lies the lush sub-tropical park of Grand Etang. Situated high in the tropical rainforest, the remnants of a once active volcano has subsided to create the dazzling volcanic crater lake of Grand Etang The climate is regulated by a cool wind, and extensive clouds draped in fog hover over the majestic peaks. It’s located in Grenada’s most northern parish, St Patricks. It is the second largest lake on the island. Lake Anotine is the source of River Antoine, which plays a vital role at River Antoine Estate, the home of Grenada’s famous Rivers Rim. Approximately half a mile from the picturesque island of Carriacou is White Island, a tropical paradise of sandy beaches, tropical flora and surrounded by coral reef systems. The clear Caribbean waters are warm and inviting, and the great diving, snorkeling, fishing in the perfect year-round temperatures in the Grenadines make White Island ideal for a personal retreat. In the village of Mount Rich are a number of petroglyphs from early Carib tribes. These are the most extensive set of petroglyphs on the island. One of the most famous landmarks in the town is the Carib's Leap, where it is said that the Caribs jumped over to escape colonization from the French. It was here, in 1651, that the last of Grenadas early settlers "Amerindians"", relatives of the North American ""Indians"", who had moved up the island chain from South America died." A beautiful leatherback turtle returns to the sea right here from Levera Beach in Grenada. So peaceful is this beach that this critter goes about the normal business of life at the Grenadian National Park. A perfect spot with perfect conditions. And when you come you'll see Mother Nature at work.